I own around 30 mascaras. I am not bragging, that is just the way it works when you're a total product...junkie. I have a few "go to" mascaras that I use when I know that I want to have a lotta lash and not much else on. One of those is Maybelline's Great Lash (I know, I know, that's what they all say). So when I heard that they had come out with a mascara claiming to make your lashes look like falsies, I of course ran to Target and purchased it immediately. OMG. I literally came home, ripped open the box and applied to one eye with my compact so that I could take a picture and compare eyes. While standing in my kitchen, mind you. 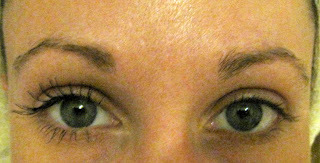 So once you get past the fact that I am makeup-less and it's about 10am, check out those flippin lashes on the left! And that was only one coat. I bought a few more so that I can sleep better at night knowing that I will not run out. Wow, look at those lashes! I am obsessed with mascara. I have a serious problem. 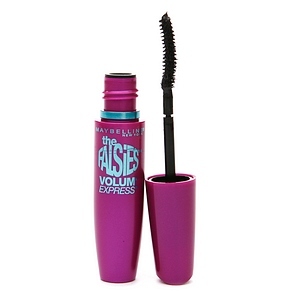 But, I have to say, even compared to some expensive mascara, this is AMAZING ! It's my go to along with L'oreal million lash. And um just a few others. Yea, only a few others. It's not like I have a problem ! ok, wait fine I do. But this stuff is AMAZE ! nice lashes! I would have bought the store too if I had that kind of result!